Creating a powerful blog or a website needs you to take care of every single step. I have already covered the first and second step to start a successful and professional blog. If you have missed them, take a look now. Now as you have learned about the first two steps, I will take you to the next step and that is about to choose a domain name. Once you have decided on the topic or niche you want to blog about, it is really necessary to take a professional domain name which tells the people what your blog is all about. Today in this guide I am going to cover everything which will help you to understand the importance of custom domain name and why buying a professional domain name is necessary. Domain name is the name of a website or blog. Domain name is the name of your site or blog. It is the online representative of your site. It tells the visitor what your blog is all about? According to the complete domain name guide, “Domain name is the key to the success of a website. It represents the name, type, and work of your online site or business.” this image will help you understand what a domain name. Now as you understand what is a domain name, let`s learn why it is important? Why domain name is important for online business? You may already know that first impression is the last impression. When a visitor visits your site, the very first thing he gets familiar with is the domain name of your blog or website. He has to type the domain name with extension to visit your site. It is the first impression. A dull domain name may take the user away from your blog, where an attractive domain name makes him visit your blog again and again. You may not find it easy to choose the exact match domain name. Now you can use keywords when you are going to choose a new domain name for your blog or site. Domain name is what makes a business brand online. When you are choosing the best custom domain name for your blog or site, you increase the chances of branding. Custom domain names look more professional as they work as independent domain name, not as the subdomain. These are few of the most common reasons why you should choose a domain name. 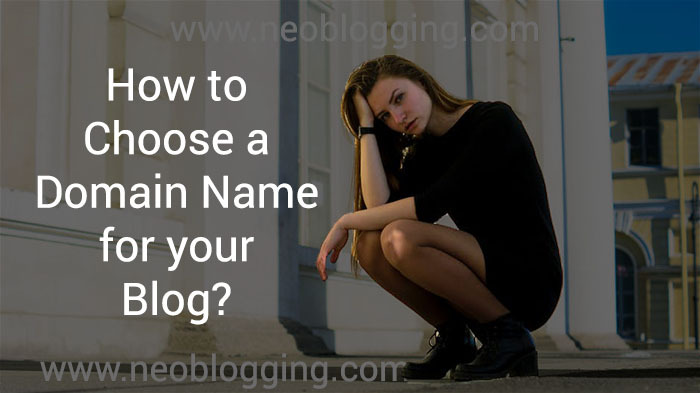 How you can choose a domain name for your blog or website? The most common mistakes that people do when choosing a domain name is to choose a generic domain name. A domain name which is not attractive and not uniqueness in that. The problem with the generic domain name is that it do not show any uniqueness and also not able to attract people. It is always good to choose a domain name which is brandable. Why? Brandable domain name always attracts the people. It not just tells the people what the site is all about, but also spread the feeling of the brand. For example: If you choose a domain name like shopfrommeonline.com or shopiingforyour.com, these looks too generic and do not contain the brand value. But if you go for shopify.com, it sounds unique and easily becomes memorable. Now you may ask that how you can find a brandable domain name. Well, it`s very easy. How to find Brandable domain name? Uniqueness always helps to grab attention. Always try to find the unique word. If you do not find it then create a word of your own, For example, Bing, Google were not the word from the dictionary, they are the production of human mind. Use synonyms’ words to create a unique domain name for your blog. It is an easy and effective way to find brandable domain names. If you are still out of the idea, then try domain name suggestion tools to find the best domain name for your blog. These tools will help you by offering various combinations of words and keywords. Short and simple domain names always grab attention. If you look at the popular brands, you will see that every big brand have a short domain name. Such as twitter, Facebook, FIFA etc. It is always recommended that your domain name should not exceed the 7 characters. Though there are some exceptions to that, still it is always the good idea to keep the domain name as short and simple as you can. There are chances that you may not find any short name on low cost. In that case, you can try to a domain name below 12 characters. Have you ever thought about why domains of big brands are easy to spell? It is because people always remember easy things. An easy to type and easy to remember domain name helps visitors easily visit your website without confusing themselves. When you want to choose a domain name and you do not know if it is simple or not, then you should tell few of your friends the name you have in mind. If they find it easy to remember then you can go for that domain but also consider the other factors. If you know SEO, then you already know the importance of using keywords in tags and content. You should also use the main keyword in the domain name. Using the main keyword in the domain name not only help the visitor understand what your blog is all about, but is also helps the search engines to show your blog when a user type the same keyword or relevant keyword in domain name. You can easily do keyword research by using Google keyword planner or SEMRush. Have you ever seen a branded domain name with hyphens or numbers? Never. Why they do not use hyphens or numbers? Using hyphens will confuse the visitor, who is typing the domain in the address bar. Using numbers in a domain name may limit your domain in a box. For example, if your domain is top10socialsites.com, it means you are telling readers that your blog does not have less than 10 or more than 10 on your blog. So don`t confuse your readers. Online business is a long term business. You can`t just get success in one day. So when it comes to choosing a domain for your blog. I always recommend you to buy domain thinking about long term goals. It takes efforts and investment to build a brand and you do not want to ruin your efforts by changing your domain again and again. .Com is the most loved TLD. Always stick with the top level domain name extensions. I always recommend you to choose a domain name with .com. Every single person in this world open website with .com extension. You need not tell the person that you have .com extension, but in other extensions, you have to tell readers that you are not using .com but using something else such as .net, .org etc. There are so many TLD`s available for you. Now you are ready to choose a brandable domain name for your blog. You can search for the domain name you want to choose on various domain name registrars. If you still not able to find the best domain name for your blog then you should definitely try domain name generator tools. Do not ever underestimate the importance of a domain name. The future of your online business depends on it. Follow the above tips and you will surely find the best and brandable domain name for your blog or website. 1) Understand what is a blog? 2) How to find profitable niche for your blog? 3) How to find best domain name for your blog? How to choose a template? How to choose a web hosting? “Sharing is caring”. Don`t forget to share what you like here on Twitter, Facebook, and Google plus with your friends and family. This web page is known as a walk-by way of for all the information you needed about this and didn抰 know who to ask. Glimpse right here, and also youl positively uncover it.